Funny bird. She was part of our life for almost two years. She went missing last Friday and we are surprised at the hole she left. I became interested in Ravens ten or fifteen years ago. I read several books by Bernd Heinrich, “The Mind of the Raven” and “Ravens in Winter” and got to observed a pair and their antics when I was camping east of Death Valley. They are fun and smart birds. I built a tall feeding platform in our back yard for Ravens and was putting out table scraps for them. They were fun to watch as they tried to beat the Seagulls to the food. Then, about two years ago, a damaged Raven showed up. She was interested in the feeding platform but was not quick enough, actually not able, to fly up from the fence to the platform. So, I made her her own special feeding platform down on the fence nearer the garage. A platform easier for her to get to and more difficult for “able” birds. It was apparent her only mode for getting around was walking the phone lines, power lines and coax cables strung from the power poles along the alley to the various homes in our block of town. 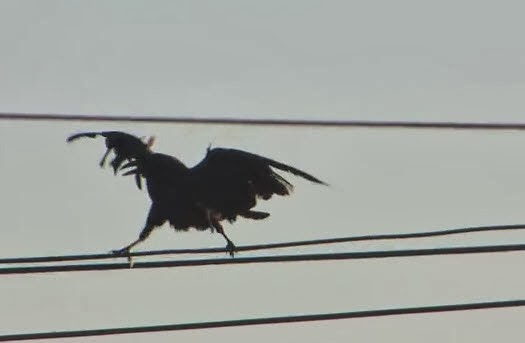 Actually Lolli was the first to notice her being restricted to walking because she saw the Raven walking the line from Gregs house to the “light” pole. As she became accustomed to her special feeding platform we gradually became more aware of what her actual territory was. 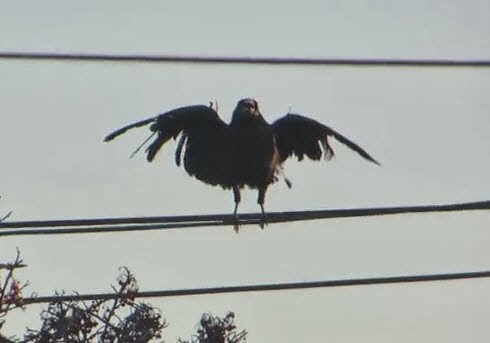 She apparently roosted in the pine trees in Bainbridge park, walked the wire to neighbor Greg's house and then on to the “Light” pole, a power pole mid alley that had a street light. She liked to stand on that street light for hours and observe her “territory”; one square block of Fort Bragg. A block bound on the east by Harrison Street, the west by McPherson, the south by Redwood Avenue and the north by Laurel Street. That’s it! In time we would say, “She is heading for Redwood”, or “She is heading for the Cat Lady’s house” (on Laurel), “The Fig Tree Lady’s house”, (Maria) mid alley. Several times I tried to follow her to see just what she did all day long but got bored and gave it up. It seemed all she did was stand around, watch over her territory and groom herself. Actually, that was about all she could do! She was a mess. It was obvious her primary feathers were damaged. They were just quills with a bit of feather towards the tip. She had about half of her secondary feathers. She could run and flap and maybe fly up about three feet but that was about it. The times we happened to see her on the ground she had a whole routine of where to go to be able to hop up onto a fence, then up on a porch eve, up on a roof and then on up onto the safety of the wires. At first, when we realized we were actually going to continue feeding her, I bought a bag of Puppy Kibble. She ate it but soon I talked to Ronnie James (local wildlife bird expert) about Ms. Scruffy; (yes we named her Ms. Scruffy!). Ronnie said it would be a lot better to feed her food high in protein and cheap scrambled eggs would be the way to go. Ronnie also said if we could keep her alive through her next molt she might grow new primary and secondary feathers. Over time we decided she was female because she would do that “nok. nok” call. Lowering her head, spreading out her throat feathers, opening her beak and make that sound except, no sound came out! Strange bird! Early on I tried to set up a video camera close to her feeding platform to capture her eating. Somehow, every time I tried to video her, she would not come! Well, she would come part way but then sense something “not right” and “run away”. I built a better video camouflage device that was radio controlled so I could turn it on from the comfort of the “mom” chair in our living room which was a perfect spot to watch the bird. No dice. There were times we had guests over and we would tell them all about Ms. Scruffy and try to show how we feed her but she would not “come to the table”. It seemed the more we wanted Ms. Scruffy to “perform” the less likely it would happen. Last June I noticed Ms. Scruffy would sit on the fence by our garage after eating. She would kind of hunker down and just sit there staring off into space for an hour or two. Not doing her “eternal vigilance” head moves like she usually did. I decided she must be brooding. It seemed reasonable to me that an adult female Raven would have a natural imperative to nest and raise young every spring even if she couldn’t build a nest or was even “pregnant?”. I decided to build her a nest! I borrowed a nice, nest shaped, woven basket from Lolli, made a wooden bracket support to support it on the fence near her feeding platform and lined it with dry grass. Perfect! The next morning we saw her on the wire by Gregs garage and knew she was coming for her morning breakfast of scrambled eggs. I put the eggs out on the feeding platform and then settled into the “mom” chair to watch and see how she liked her new nest!. Ms. Scruffy hopped from the wire onto our garage roof, walked along the peak to the east end and then down to the gutter just a leap away from the fence. She got to the gutter and was about to hop down onto the fence when she spotted the “nest”. She ran back up to the peak of the garage but then stopped, thought about it “how hungry am I?” (I’m anthropomorphizing, of course) turned around and walked back down to the gutter. Opps! Still there!! Run-away!!! Back and forth, up, down. Up, down! Seventeen times she “snuck up” on her scrambled eggs and then “ran away” before she finally hopped down onto the fence, hurriedly ran and hopped over my “nest”, got to the eggs for a frantic gobble followed by a quick get-away! Whew! The following morning Lolli sat in the mom chair and observed Ms. Scruffy walk up and down the garage roof TWENTY-NINE TIMES!! before she just flat gave up and ran away without breakfast!! I went out and removed “my” nest experiment and in a few days life settled back down to normal! Another time, after noticing how she liked to take a mouth (beak) full of scrambled eggs with her after she had cleaned the platform, she would hop up on our garage and then up and over to the gutter on Ray’s apartment and then drop the eggs in the gutter and then eat them. I figure she was using water to help wash them down. So, I made her her own gutter. I took a short section of gutter, blocked off both ends, put it by her feeding platform with half an inch of water in is so she could have her own water source close by. Bad idea. She did not like it and it seemed her reflection in the water spooked her even more. She sort of put up with it for a while but I finally removed the gutter watering station too. She did not like anything “Strange”. We went on Winter Break for the first time in six years. Being gone for two weeks, we were worried about Ms. Scruffy. We talked to various neighbors before we left and discovered the “Fig Tree Lady” was feeding her cat “cat food” and allowing Ms. Scruffy to partake. We also asked Cecile if she would come over and put food on the feeding platform for Ms. Scruffy and gave her some money for eggs. Away we went hoping for the best. Two weeks later we arrived home and while I was unloading the Vanagon I notice Ms. Scruffy up on the power pole by Laurel Street watching me!! Yippee! She’s alive!! Later in the week we happened to see Maria and she said she had put out some cat food, while we were gone, on a paper plate right where I usually park the Vanagon in the alley. Ms. Scruffy walked up to the plate, dumped the cat food off and put the paper plate back out in the alley!! Maria didn’t know if Ms. Scruffy was asking for more food or was insulted by the paper plate! The house just beyond Gregs started a big renewal and addition project and that really threw Ms. Scruffy into a tizzy. Her favorite power line from her roost in the park to the light pole in the alley was right over the construction site!! She developed a new route from Gregs roof to our garden shed roof, then onto our roof and over to our garage roof and then down onto the fence and over to the food platform. But she didn’t like it and every time a nail gun went off or a skill saw started up she would jump or flinch. Very nervous and trying times. She would not show up for several days at a time and we didn’t know if she got caught by a dog or what. And then, there she would be again. I talked to Ronnie James and she told me wildlife are opportunistic eaters. They gorge when they can and then will not eat for days when the weather is bad. They do not eat “Three Squares a Day”! That bit of information eased our mind. Now we are into March of our second year with Ms. Scruffy and she has finally gone missing, really gone missing.. It was a strange thing. Thursday she showed up three times. In the morning Lolli fed her. When I returned home from my bike ride at noon she was waiting on the garage roof by the gutter. I fed her. And again at 4:30PM she stopped by and hollered a couple of times to get my attention and I put out some more scrambled eggs. The next morning around 6:30 we woke to quite a Raven commotion. Lolli got up and looked out the bedroom window and said there were hundreds of Ravens flying around but no Scruffy. All day long Ravens would fly over Scruffy’s “one block” territory and call out. It was not a “normal” morning or day and both Lolli and I noticed “something different” in the Raven world. Maybe it was just juvenile Ravens ganging up for springtime mating rituals. Maybe Scruffy was really gone and already Ravens were arguing about who gets to take her territory. Maybe Ravens actually know when one of their own gets attacked, trapped, killed. In fact, in hindsight, there was a heck of a lot we didn’t know about a Raven that was confined to only one city block!! Two years and we knew so little. It is amazing how much we miss her and how often we look out the window when we hear a “caw, caw, caw”. Ms. Scruffy doing the female "nok nok, nok behavior". Eating.off the tall platform in the early days. Eating off the "private" platform. Nice story Bro. I liked that bird even though we never met in person or bird. Interesting story. Thanks for sharing it. Hopefully she will find her way back to you. Ravens are interesting birds. I have always wanted to read "The Raven" by Edgar Allen Poe. A beautiful tribute to your friend, Ms Scruffy. Thank you for letting us into your lives.